Custom dialer to call Service::noteNewWaiter and noteGoneWaiter to maintain Service idea of waiting and being-notified transactions. Definition at line 194 of file ServiceRep.h. Definition at line 28 of file AsyncJobCalls.h. Definition at line 29 of file AsyncJobCalls.h. Definition at line 92 of file AsyncJobCalls.h. Definition at line 197 of file ServiceRep.h. Definition at line 741 of file ServiceRep.cc. Definition at line 749 of file ServiceRep.cc. Definition at line 755 of file ServiceRep.cc. Definition at line 159 of file AsyncJobCalls.h. Definition at line 169 of file AsyncJobCalls.h. Definition at line 102 of file AsyncJobCalls.h. References JobDialer< Job >::job, and method. Definition at line 96 of file AsyncJobCalls.h. Definition at line 37 of file AsyncJobCalls.h. Definition at line 99 of file AsyncJobCalls.h. Definition at line 198 of file ServiceRep.h. 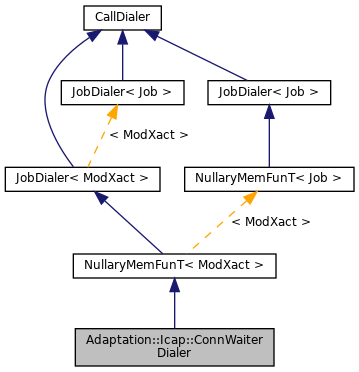 Referenced by ConnWaiterDialer(), and ~ConnWaiterDialer().